The last time the Rockies had a losing April was in 2010. Coincidently, that was the last time the team closed the season with a winning record. The Rockies 11-12 start to the season does not leave the team in bad shape at all, as the top four teams in the NL West were all within one game of first place coming into May. By winning Sunday the Rockies sit at .500 and are tied for the NL West lead. After coming off a punishing home stand, the Rockies got amnesia quick, erasing the bad taste in their mouths with a sweep of the Diamondbacks. Just to help illustrate how difficult it is for the Rockies to win at Chase Field, this is the first time the team swept the D’backs in their backyard since July 2004. The only other time before that was in 1998, in the first three games the Arizona club ever played. Chatwood has become the Rockies ace on the road, blanking the D’backs into the seventh inning. With a .46 ERA away from Coors Field, he earned his second win in Arizona, starting the rehab from the difficult home stand. The home runs are coming in droves on the road, as the club has hit 20 bombs in 10 road games, as opposed to 17 in 12 games in Denver. Four Rockies hit a homer, including Nolan Arenado and Trevor Story, who launched their 10th of the season. What was even more special for the team was that Ray had not allowed a home run in his first 24 innings this season. With his latest homerun, Story tied White Sox first baseman Jose Abreu to tie the MLB rookie record for homers in April. This game is in the conversation for the most complete game of the season on both sides of the ball, and it helped set the tone for the rest of the series. Story hit better in this game because he didn’t look like he was trying to hit a home run. In the ninth inning, he drove one to the opposite field to break the tie and break the game open. Rusin outdueled Greinke in a spot start, which is never supposed to happen — kind of like eating string cheese in bites. This season has been all about whether the bullpen shows up in a series. Carlos Estevez gave up a two run homer to tie the game, but Jake McGee was able to rebound from his difficult outing against the Dodgers, earning the save. 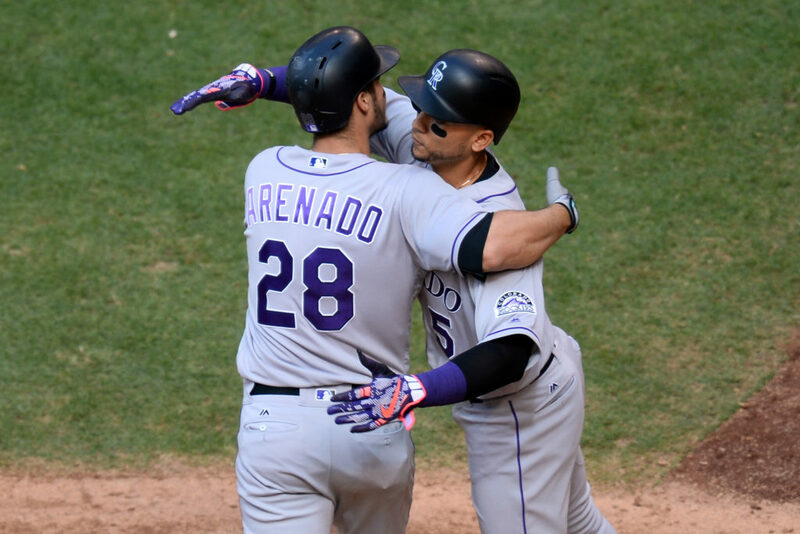 The Rockies didn’t need Story to complete the series sweep when they have the league-leading home run hitter in Nolan Arenado. The most important take away here is the confidence Walt Weiss showed in his young reliever, Estevez. Less than 24 hours after the righty gave up a game-tying home run to Brandon Drury, Weiss put Estevez in a very difficult position. While Weiss arguably kept Bettis in the game too long, the bases were loaded with only one out in the seventh inning. After Boone Logan got the second out, Weiss gave Estevez the opportunity to show what he can do in the face of adversity. All the 23-year-old kid did was strike out Yasmany Tomas on a 98 mph heater, killing any momentum Arizona had of coming back in this game. Even if Estevez didn’t rise to this occasion, Weiss showed an immense sense of responsibility by developing the future of this Rockies bullpen. Showing confidence in these relievers is what is going to take this team beyond just another good start to the season.